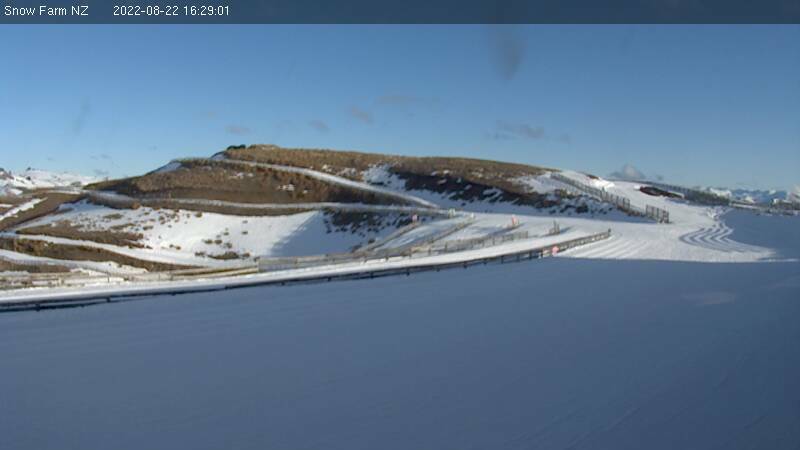 Cardrona Alpine Resort ↑62° ↓53° Forecast: 0" Base: 0"
Winds variable at 1 to 8 mph through the morning shifting to variable at 2 to 10 mph in the afternoon, evening with gusts up to 13 mph. Mostly cloudy through the morning, and then partly cloudy becoming mostly clear with a few clouds into the evening. Winds NW 8 to 17 mph through the morning becoming 7 to 16 mph in the afternoon, evening with gusts up to 21 mph. Partly cloudy becoming overcast through the morning, and then mostly cloudy through the afternoon and evening. Winds NW 9 to 20 mph through the morning becoming N 8 to 19 mph in the afternoon, evening with gusts up to 25 mph. Cloudy through the morning, and then partly cloudy becoming mostly clear with a few clouds into the evening. Chance of rain after daylight and then rain in the afternoon. Winds NW 9 to 20 mph through the morning becoming 7 to 16 mph in the afternoon, evening with gusts up to 25 mph. Mostly clear with a few clouds becoming mostly cloudy through the morning, and then mostly cloudy through the afternoon and evening. Chance of rain in the evening. Winds NW 25 to 37 mph through the morning becoming variable at 0 to 8 mph in the afternoon, evening with gusts up to 46 mph. Mostly clear with a few clouds becoming clear through the morning, and then mostly cloudy becoming partly cloudy into the evening. Chance of rain after daylight. Morning winds around the base W 4 to 13 mph with gusts up to 16 mph. Afternoon winds around the base S 6 to 15 mph with gusts up to 19 mph. Morning winds around the base NW 14 to 26 mph with gusts up to 43 mph. Mostly cloudy becoming mostly clear with a few clouds into the evening. Chance of rain in the evening. Afternoon winds around the base NW 26 to 38 mph with gusts up to 53 mph. Morning winds around the base NW 16 to 28 mph with gusts up to 49 mph. Afternoon winds around the base 35 to 47 mph with gusts up to 65 mph. Morning winds around the base NW 16 to 28 mph with gusts up to 44 mph. Mostly cloudy becoming clear into the evening. Expect periods of rain through the afternoon and evening. Afternoon winds around the base NW 25 to 37 mph with gusts up to 52 mph. Morning winds around the base NW 52 to 64 mph with gusts up to 80 mph. Cloudy becoming partly cloudy through the afternoon and evening. Chance of rain and snow in the afternoon, rain and snow in the evening. Snowfall expected to be a trace amount in the afternoon, then another trace in the evening.